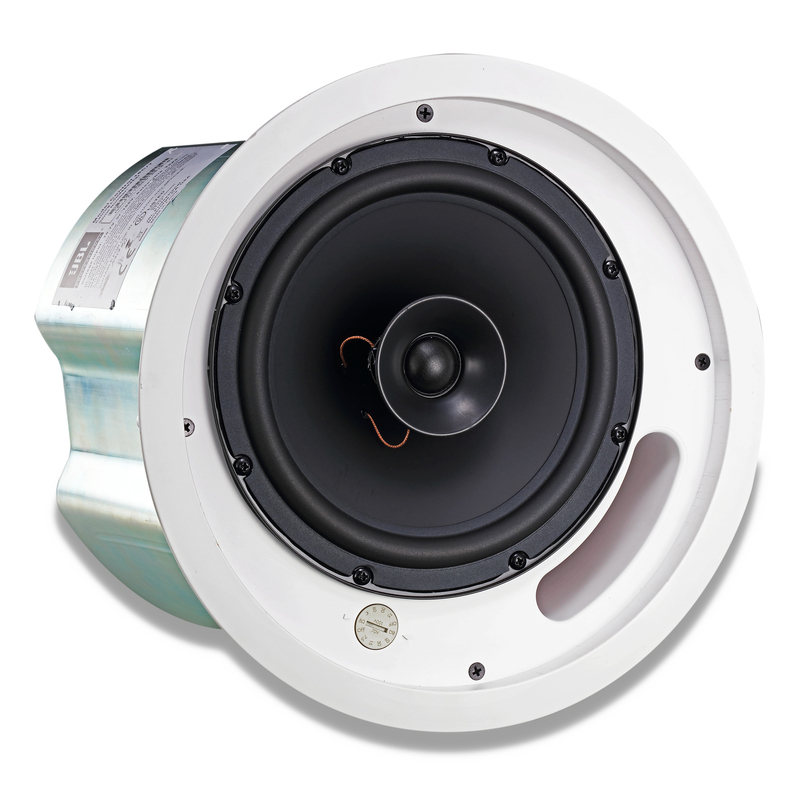 Control 18C/T is a full-range ceiling speaker consisting of a 200 mm (8.0 inch) high tech cone driver and a 25 mm soft-dome liquid cooled tweeter mounted in a vented, paintable baffle made of UV resistant UL94-V0 and UL94-5HB material, with a pre-attached blind-mount backcan for quick and easy installation. The speaker is designed to provide excellent sound quality for a wide variety of medium to high volume applications such as music cafes, business music systems, retail stores, music/paging systems, airports, reception/waiting rooms, lounges, courtrooms, convention centers, hotels, educational facilities, and more. connector, grille with safety tether. the system’s ability to handle normal speech and music program material, and is defined as 3 dB above the Continuous Pink Noise Rating. 3 Half-space (in ceiling) average 1 kHz to 16 kHz. 4 For protection against driving below resonant frequency and to keep transformer out of saturation. JBL continually engages in research related to product improvement. Changes introduced into existing products without notice are an expression of that philosophy.